Some residents in West Boca Raton are upset about a proposed redevelopment that would put up about 400 new homes around a golf course. WEST BOCA RATON, Fla. — Some residents in West Boca Raton are upset about a proposed redevelopment that would put up about 400 new homes around a golf course. 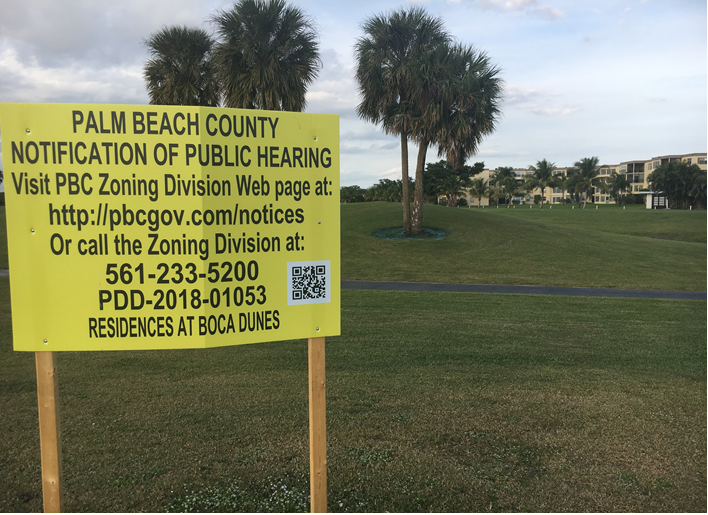 Yellow signs dot the Boca Dunes Golf Course, letting people a possible change is on the way. Michael Dropkin lives nearby. He’s nervous about the way his community could look. It was a main topic of the discussion at the monthly West Boca Community Council meeting. "They’re unhappy. Period, with the development,” she said in an interview after the meeting. The council heard complaints about traffic, school overcrowding, security, environment and devaluing homes if it’s built. "We will reach out to the developer (Wednesday), discuss with them, set up additional meetings with the residents that are concerned and see if we can come to some sort of happy medium,” she said. The Palm Beach County Zoning Board approved the development earlier this month and recommended the Palm Beach County commissioners do the same on Jan. 24. As long as the developer is following the law, it’s unlikely for it to fail altogether. If commissioners do not pass it, it could set up for a costly lawsuit. One option discussed at the meeting Tuesday was for the PBC commissioners to delay the vote so a compromise could be met between community and developer.